A comprehensive guide and fact sheet about the Crown of Egypt. Discover fascinating facts and information about the Ancient Egyptian Crowns and other royal headdresses. Click a link for additional information and interesting facts about subjects relating to the ancient Egyptian Crown and other aspects of ancient Egyptian daily life, the people and places. The crown of Egypt was an ornamental headdress signifying the sovereignty and royalty of the Pharaoh. The ancient Egyptian crowns symbolized the authority and legitimacy of the ruler of the country. The ancient Egyptian crowns came in different sizes and shapes that identified the king with different areas of the country and connected him with the ancient Egyptian gods. The royal crowns were worn on all official state and religious occasions. Although the new pharaoh immediately assumed the Egyptian throne his coronation ceremony did not take place until the first day of a new season which symbolized the beginning of a new era. The crown of Egypt played a central role in the coronation of a new king. Various ceremonies and rituals were required before the new ruler was allowed to wear the crown of Egypt. These ceremonies included the Sokar festival and the Sed festival. The coronation of a new king invested the new ruler with the insignia of royalty when he succeeded to the sovereignty. The "two lands" of ancient Egypt referred to the Nile Delta region that bordered the Mediterranean called 'Lower Egypt' and the lands of The Nile Valley that bordered Nubia called "Upper Egypt". In predynastic times there was a king for each of the "two lands". Each king had his own crown, one was red and the other was white. The country was unified and the red and white crowns were combined to symbolizing the unification of the country. The Red crown of Egypt was called the Deshret and represented Lower Egypt (in the Nile Delta of the North). The Deshret crown was believed to have been given by the god Geb to Horus, the son of Osiris to rule over Lower Egypt. The cobra goddess, Wadjet, was the protector of Lower Egypt and is depicted wearing the Deshret red crown. The red crown represented the 'Red Lands' of the ancient Egyptians. The red crown of Egypt is characterized by a curly wire in its end representative of the proboscis of the honeybee. In Egypt the honeybee a sign of royalty. The picture of the 'eye' depicts Wadjet and Nekhbet, the guardian goddesses of ancient Egypt referred to as the 'Two Ladies'. The White Crown was called the Hedjet, and represented Upper Egypt (the South of Egypt). Nekhbet, the white vulture goddess was the guardian of Upper Egypt and was often depicted wearing the white Hedjet crown of Egypt. The white Hedjet crown was often combined with ostrich feathers on each side and in this style was called the Atef crown. 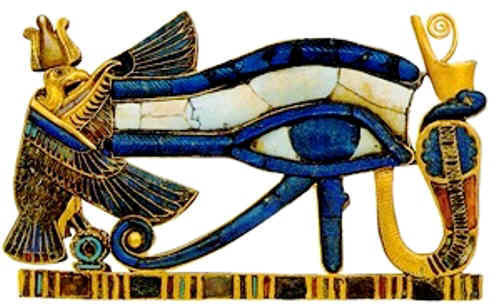 The Atef was occasionally depicted topped with a gold disk and represented Upper Egypt, as shown in the 'eye' picture depicting the vulture goddess. A famous and early depiction of the White Crown is found on the Narmer Palette in which Narmer, the king of the South, wearing the hedjet white crown, is shown triumphing over his enemies in the North. The pharaohs of the 1st Dynasty started with King Narmer(also refer to Menes) who is credited with founding the first dynasty of kings and the unification of Egypt. 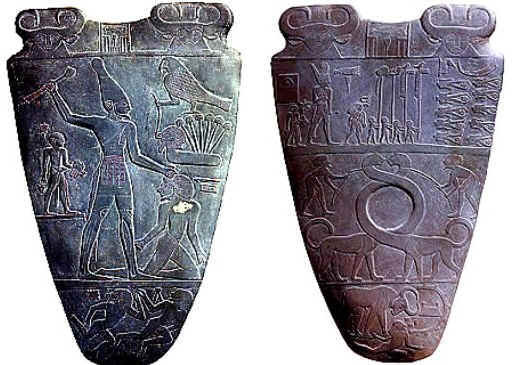 The reverse side of the Narmer palette shows the king wearing the Deshret crown (top left) indicating his sovereignty over the conquered north. King Den was the first ruler to use the title King of Lower and Upper Egypt and the first pharaoh depicted wearing the Pshent Double Crown of Egypt. The Double crown of Egypt was called the Pshent and represented a unified Egypt. When Egypt was unified and the red and white crowns were combined to symbolizing the unification of the country. When the two nations were united, so were their crowns. As time passed other styles of crowns were also adopted by the ancient Egyptian pharaohs. The Khepresh was the blue crown that was worn by Pharaohs in battle and featured the Uraeus rearing cobra symbol on the front of the crown. 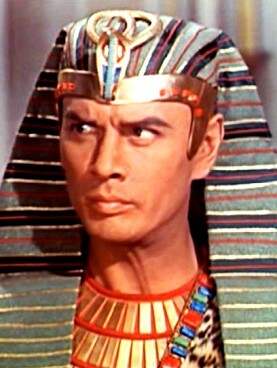 (The blue Khepresh crown was worn by Yul Brynner who played Pharaoh Ramses II in the 1956 movie, The Ten Commandments). The Nemes was the striped head cloth worn by the later pharaohs. (The picture below shows the royal headdress worn by Yul Brynner as Ramses). Not one crown has survived but the picture provides an approximation of what the headdress looked like and shows the prominence of the Uraeus rearing cobra symbol. The Uraeus was originally the symbol of the Pharaohs of Lower Egypt. The Uraeus appears as a symbol worn on the royal crowns and nemes and is also associated with the sun and with many Egyptian gods and goddesses. The Nemes headdress was tied at the back of the head with lappets that fell down either side. The Royal Vulture crown was worn by the most revered royal women. 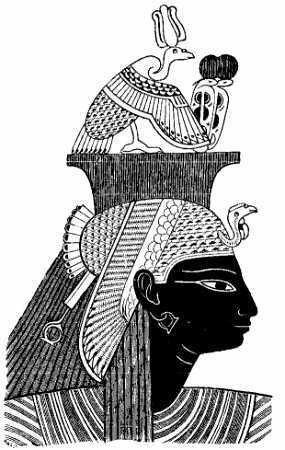 The Royal Vulture Crown that consisted of a falcon feather headdress with its wings spread round her head in the act of protection, once again reflecting the Nekhbet, the white vulture goddess. The Royal Vulture Crown was adorned by a Uraeus, the rearing cobra emblem and symbol of the Pharaohs. 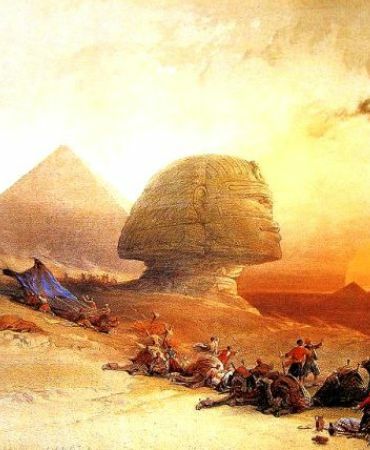 Learning about the ancient Egyptians and the ancient Egyptian Crowns inspires everyone to visit historical sites and undertake Egyptian Travel and Tours to experience the wonders of this magical land at first hand. Many people choose to experience a tour on a Nile Cruise stopping at the famous destinations and ancient Egyptian sites such as the Pyramids of Giza and the Great Sphinx. The information and facts about the ancient Egyptian Crowns will provide you with a great insight into the legacy of the ancient Egyptians.